Every so often, my parents clear out a drawer, or a box, or the fridge, and get rid of things that they don't need anymore. They don't want it to go far, of course My dad is a bit of a pack rat, no matter how hard my mother tries to change his ways. If my dad were left to his own devices, his house would end up on a "very special" episode of Hoarders. My mother is vigilant in her efforts, however. So my dad attempts a work-around. "Get rid of" and "clearing out" in my family means that I get a phone call. "We're cleaning out the fridge," my dad called the other day. "Do you want all of this wine?" "Sure," I said. It was a win-win, I thought. I like wine, and my dad would be comforted by the nearness of his "stuff". I hung up the phone and went back to my coffee. A few minutes later, the doorbell rang. It was my dad, with a box. I began pulling small bottles out of the box. "Uh...how old is this wine?" 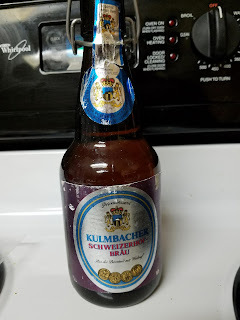 I looked at the label, which was in German. The date said 1971. "We got it in Germany," my dad said. "So 1973 or so. Oh, and here--" He handed me a beer instead of a bottle of wine. "Wait--how old is this beer?" I looked at the scraped label. "It's from Germany, too," my dad said. He left to toss some frozen hamburger from 2011. I looked at the wine more carefully, holding up a bottle and checking for weirdness, like little particles or cloudiness. I put those that looked safe in the fridge, then picked up the beer. I held it up to the light. Instead of particles, there were clumps. There were CHAINS of clumps, like a little nebula inside the brown glass. Entire colonies of bacteria were floating in that bottle, and likely had been growing since the 70s. Bacteria that had never been seen before might be in there. Instead of a beer, I had an almost fifty year old science experiment. I wondered if my bottle contained the German equivalent of kimchi, and a new health craze would be born. Maybe Zane could show this off at a science fair, and win first prize, I thought. My mom texted me at that moment, telling me NOT to drink the beer. There are no preservatives in that beer, she said. Things could be growing in there, she said. Throw it out, she said. Throw it out? What if this beer was sentient? What if the bacteria were released into the ecosystem and ran amok, causing a plague of epic proportion? As I stared at the viscous fluid moving around, my nausea was replaced by nostalgia. I grew up with this beer in the house, the colonies of bacteria slowly growing along with me. This beer and I had been through many moves, across oceans and time zones. It was practically a sibling. Multiple siblings, if the number of bacteria clumps were any indication! How could I throw that out? How could I possibly destroy that? The answer is that I could not. The bottle is still sitting on my stove, while I decide what to do. I may call a local research center or college, to see if they are interested. Or perhaps I will just stick this particular family member into the back of my fridge, following in my father's footsteps. I made sure to say that last part out loud, just in case the bacteria actually IS sentient. Can't be too careful in my family!